Although we wanted to push for a 25km hike after our 23km hike last weekend, the distance between a number of parking lots were rather limited in choice so we had to reduce our hike to only 21km. We were surprised to find that parking is actually pretty expensive on the Toronto section of the Bruce Trail. 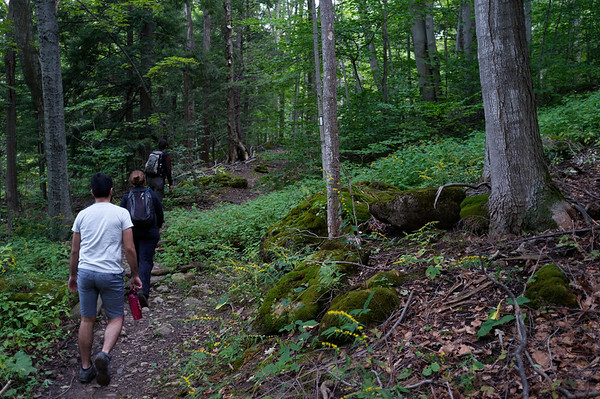 We were rather eager to tackle this final section of the Iroquois section of the Bruce Trail and the hike started with some amusement when we realized one of our part-time hikers was a little under prepared for the hike. After poking some fun at the “tourist”, we went on our way. The trail was relatively flat although surprisingly unmaintained. 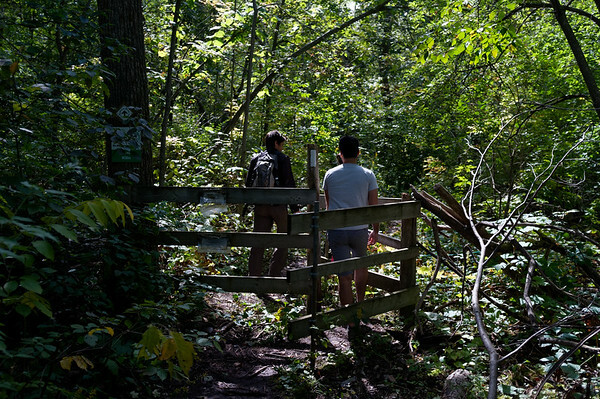 There were areas with significant overgrowth and anyone wearing shorts might find this section of the trail pretty uncomfortable at times. The early part of this section was also a bit stinky. The bogs in the area end up producing quite a bit of sulphur-like aroma. 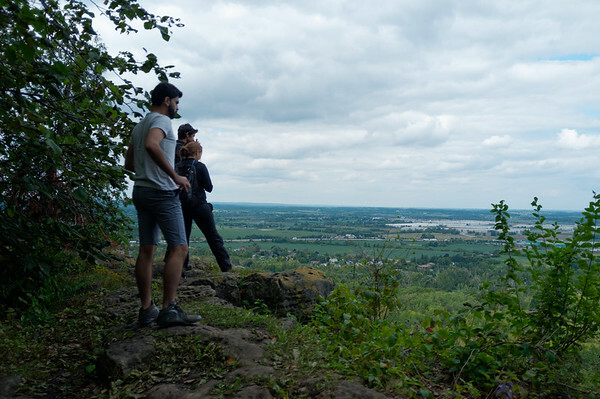 We did make it to certain parts of the escarpment — particularly as we were passing through the major conservation areas such as Rattlesnake point. 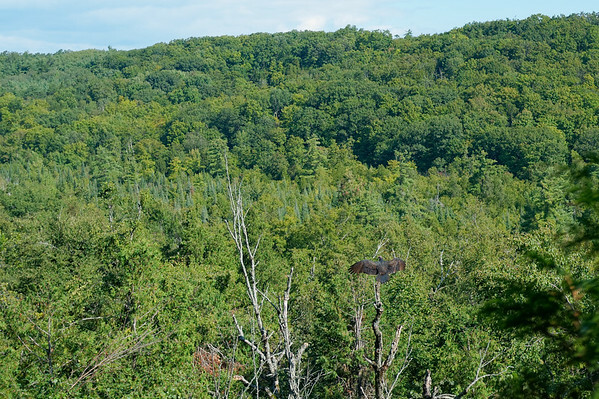 There were a number of lookouts and we had once again more opportunities to see turkey vultures. There were some points of the trail that were not only unmaintained but also pretty challenging for folks who aren’t accustomed to hiking. 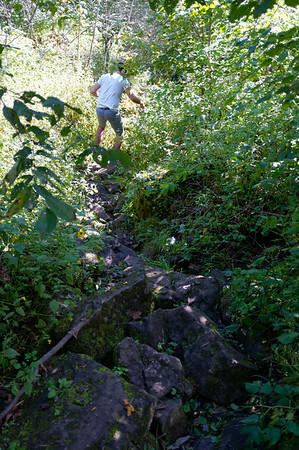 This part of the trail was completely made up of medium-sized uneven stones. 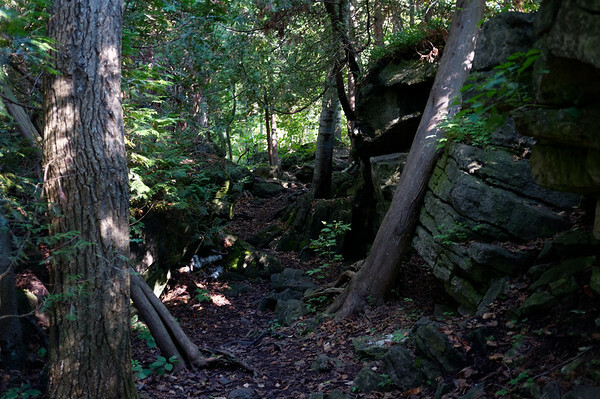 We’ve encountered some sections of the Bruce Trail like this as well and usually people find it is easier to navigate with trekking or hiking poles. 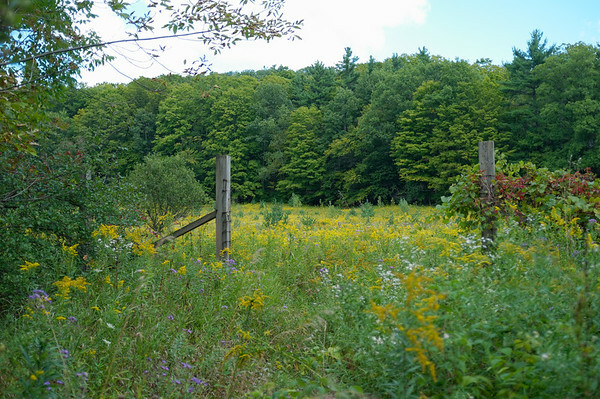 Similar to our recent hikes, we’ve been noticing a large number of wildflowers — having encounters with many vast and beautiful fields full of them. Aside from noticing the typical landscaped gardens in the city, it is always so much more pleasing to see what mother nature has in store for us as we pass through these different areas. Surprisingly, as we hiked through certain parts of this hike — we found ourselves encountering a large number of other hikers and mountain bikers. We had merely sat down to enjoy a snack and within minutes had large numbers of people pass by us in all directions. Must’ve been an excellent day to get out and about! It wasn’t hot nor too cold. This part of the hike is rather fascinating from a personal standpoint. 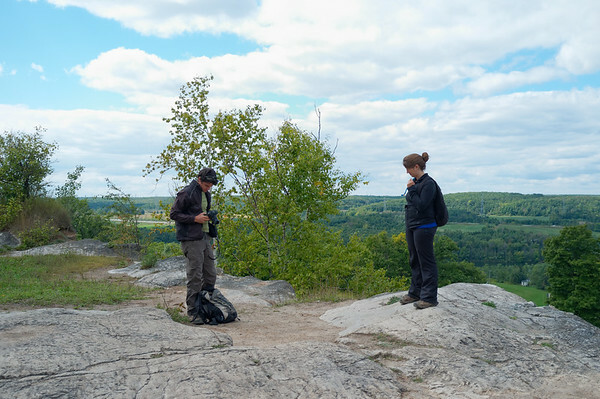 There were a lot of opportunities to enjoy and take in great views from the escarpment. 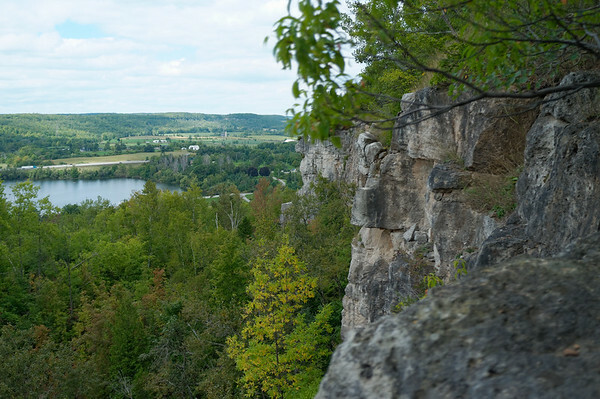 For years, I have travelled back and forth on the 401 west of Toronto and on each of those trips, I had passed by these escarpments — curious as to whether it were possible to stand and hike along these tall cliffs. This hike served as a fulfilling answer as I stood on the escarpment looking out to the highway. I wonder how many people pass by on the 401 with the same idea or thought. Every so often on these hikes, I encounter the most out of context peculiarities. I’m never sure what to think but I do enjoy these random encounters. 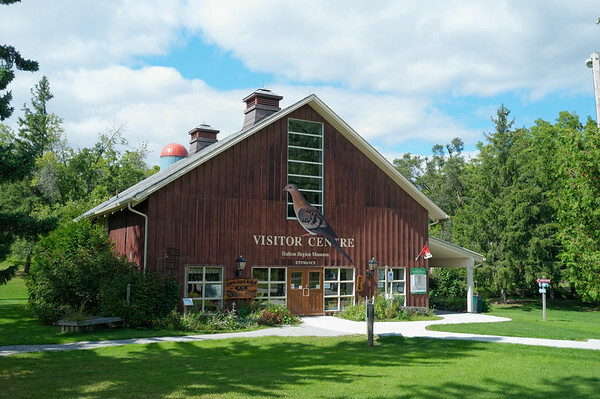 I’m a bit puzzled though about giant pigeon on that visitor centre building. We also encountered a lot of funny names for mountain bike trails like “Gateway to Heaven”. A little over-the-top? Given the length of the Bruce Trail, it’s always exciting to complete a section of it. It is important recognize and photograph the milestone. In this case, it was the bridge that 401 traffic was passing over. 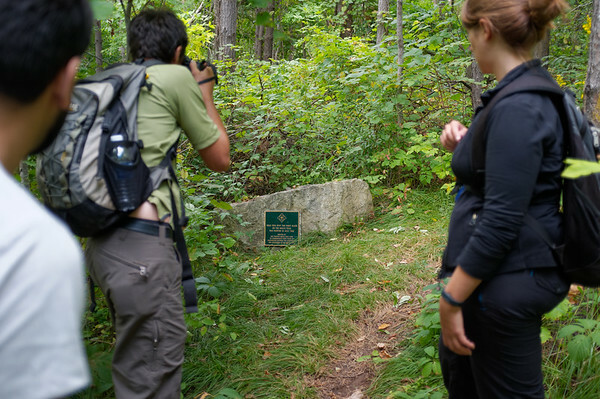 Another really awesome encounter was a commemorative plaque marking an approximate location where the first trailer blaze marker for the Bruce Trail was painted. Pretty amazing to think that people have been hiking this trail for so many decades. Through out the hike there were early signs of autumn. 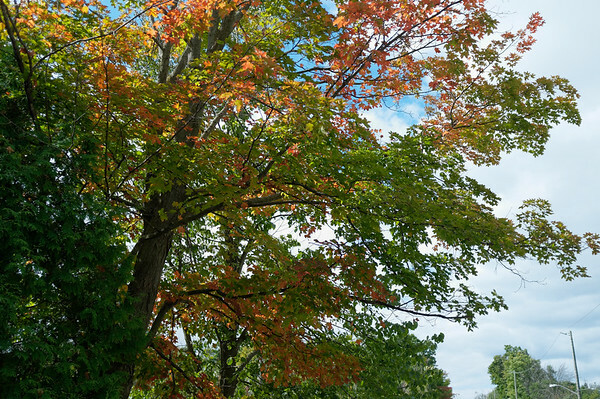 Some friends and I will be heading to the Adirondacks soon so hopefully we’ll catch some more autumn colours! This hike wasn’t bad but I was hoping for some more interesting scenery. Still, I loved the vast fields of wildflowers and having the opportunity to stand on the edge of the escarpment was brilliant and reminded me of my years past. 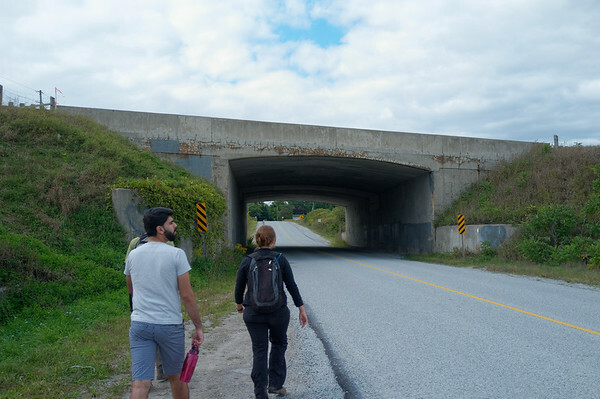 Hopefully the next hike will be even more interesting as we begin a full part of the Toronto section of the Bruce Trail. The full gallery from this hike is available here.